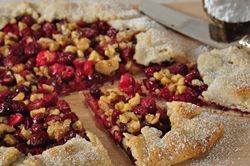 This free form Cranberry Galette (Tart) takes tart and tangy fresh cranberries and chopped nuts, sweetens them with sugar, and then wraps them in a buttery crisp pastry. It is lovely warm from the oven, at room temperature, or even cold. If you like, serve it with softly whipped cream or a small scoop of vanilla or caramel ice cream. I really like the look of free form tarts. And I also like that you don't need a tart pan. The pastry is simply rolled into a round and placed on a baking sheet. Then you just cover the pastry with the filling, and the ends of the pastry are placed up and over the filling. So easy. Before I even start making the pastry, I like to cut the cranberries in half, combine them with the sugars, and let the mixture sit. Doing this step gives the cranberries a little time to absorb some of the sugars which will soften their outer skins. Then when you're pastry is ready, just stir the chopped nuts (can use walnuts, pecans, almonds, and/or hazelnuts) into the filling, along with some candied mixed peel if you like, and it's ready to be baked. While you can serve this Cranberry Galette the day it's baked, it does benefit from sitting overnight. That way the tart flavor of the cranberries softens. So this is a great do ahead dessert. Perfect for the holidays. Cranberry Filling: Place the walnuts on a baking sheet and bake in a preheated 350 degree F (180 degree C) oven for about 5 minutes or until lightly brown and fragrant. Remove from oven, let cool, and then coarsely chop. Meanwhile, in a large bowl, combine the cranberries with the sugars. Cover and let sit (stirring about every 15 minutes) at room temperature while you make your pastry. Pie Pastry: In a food processor, place the flour, salt, and sugar and process until combined. Add the cold butter and process until the mixture resembles coarse crumbs (about 15 seconds). Sprinkle about 3 tablespoons of ice water over the pastry and process just until the pastry holds together when pinched. Add a little more water, if necessary. Turn the pastry out onto your work surface, form it into a large round, cover with plastic wrap, and refrigerate until firm enough to roll out (about 30 - 60 minutes). Once the pastry has chilled, remove from refrigerator and place on a lightly floured surface. Roll the pastry into a 13 inch (33 cm) round. To prevent the pastry from sticking to the counter and to ensure uniform thickness, keep lifting up and turning the pastry a quarter turn as you roll (always roll from the center of the pastry outwards to get uniform thickness). Transfer the pastry to a parchment paper lined baking sheet. If your pastry is soft, cover and place in the refrigerator for about 15 minutes. Stir the chopped nuts and candied mixed peel (if using) into the cranberry filling. Evenly spread the filling on top of the pastry, leaving about a 2 inch (5 cm) border. Gently fold the edges of the pastry up and over the filling, pleating as necessary. Lightly brush the edges of the pastry with cream and sprinkle with a little granulated white sugar. Bake for about 25 - 30 minutes, or until the crust is golden brown and the cranberries are wonderfully soft. Remove from oven and place on a wire rack to cool. Serve plain or with softly whipped cream or vanilla ice cream. Cover any leftovers and the Galette can be stored at room temperature, or in the refrigerator, for about 3-4 days.